Learn more about Mammoth Lakes as an event destination. "This is a remarkable opportunity for our beautiful and diverse destination to familiarize potential visitors, meeting and event planners, wedding couples and the media with all that Mammoth Lakes has to offer,” said Sandra DiDomizio, Owner of Green Fox Events & Guest Services. This spring, plan to attend the Mammoth Lakes Event and Wedding Expo on Saturday, April 21 from 3-6 p.m. at The Westin Monache Resort in Mammoth Lakes. Presented by the Mammoth Lakes Chamber of Commerce, The Westin Monache Resort and Green Fox Events and Guest Services, with support from the Mono County Tourism & Film Commission, the Expo provides a centralized event where potential clients and local business owners can network and perform both Business-to-Business (B2B) and Business-to-Consumer (B2C) activities. The emphasis is on showcasing all meeting and event-related services available in Mammoth Lakes and Mono County. The Expo is a must-attend if you are interested in learning about Mammoth Lakes as a destination for groups that are looking for unique, customized experiences. Set your family reunion, corporate retreat, friends weekend or wedding apart with a majestic backdrop and year-round recreation offerings in Mammoth Lakes. The event will consist of more than 30 vendor booths. All guests will be able to interact with the exhibitors and book services on the spot if they desire. "This is a remarkable opportunity for our beautiful and diverse destination to familiarize potential visitors, meeting and event planners, wedding couples and the media with all that Mammoth Lakes has to offer in terms of attractions, activities, venues and services,” said Sandra DiDomizio, Owner of Green Fox Events & Guest Services. “It’s also an opportunity for our community to come together to learn about all that is new in our town to better sell and promote our destination to visitors and clients." 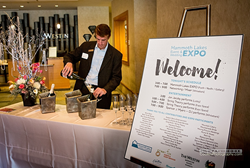 The Expo will be followed by a happy hour mixer at Whitebark at the Westin from 6-7 p.m. The event is free for guests to attend, but an RSVP at MammothLakesExpo.com is requested. Vendors who are members of the Mammoth Lakes Chamber of Commerce can reserve a booth space for free. Non-Chamber members will be charged $80. Partners and participants are encouraged to invite potential clients to the Expo. To learn more and RSVP for the event, visit MammothLakesExpo.com.